The site, as reported by Mashable, is “aimed at buyers in the business, industrial, scientific and commercial spaces”, however, anyone can order from the site. Being that I buy pretty much everything from Amazon (including my daughter’s loft bed and, most recently, a refrigerator), I was curious as to what this was all about. 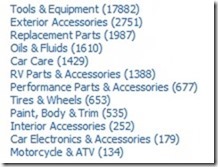 To my surprise, they are offering a wide variety of auto parts, car care items and even wheels and tires. 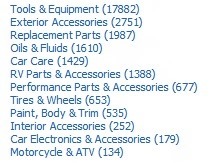 (See the Fleet & Vehicle Maintenance category). As you can see, they have quite a large inventory of items. Unlike Amazon’s Marketplace, it’s unclear whether these items are being sold by Amazon directly or through third-party sellers. How, or will, this effect your parts business? Amazon has typically made sure they are the lowest price in any market. With free 2-day shipping on orders over $50 and no sales tax (in most cases), I’d say they have a distinct advantage from the get-go. How long before they try their hand at selling cars or listing dealer inventory (at a cost, I’m sure). Amazon is increasingly trying to be a consumer’s one stop shop for everything. I’ve bought everything and anything imaginable on Amazon and have yet to find something NOT on Amazon. Consumers may always need someone to install and service the vehicles but it just became a little easier and more attractive for them to not spend money in your parts department. Social media is all about engagement. The option to “friend” someone or “like” a business’ page exists to enhance the user’s experience and present to them only what they have chosen to see and engage with. If you choose not to engage with someone, you simply don’t accept their friend request. YOU choose which business’ Facebook page you are interested in having information delivered to you. Imagine if Facebook were completely open. “Friends” didn’t exist. You saw every status update from every person on Facebook and every business. Facebook would cease to exist except maybe as a search engine. There would be too much noise. Facebook even recognizes this by filtering status updates for you and providing you with the option to create lists of people so that you can not only tailor who sees any particular piece of content but so you can easily filter out status updates and content into subgroups of your friends. Then came Facebook groups. Initially, I thought this was a splendid idea. The ability to create an open or private group of individuals who share like interests and who can interact with each other without having to “friend” any group member. It offered a convenient way of sharing via a group Facebook e-mail address and, at the time, it was one of the only noise-reduction alternatives on Facebook. Facebook groups has now become a convenient way to spam people in your social network against their permission. The ability to add people to groups without their consent has become not only a nuisance but, I believe, has actually decreased the value and allure of groups. I cringe whenever people add me to a Facebook group because 1) it irritates me that people can be presumptuous enough to choose what I’m interested in seeing and 2) because Facebook in their infinite wisdom chose to make the default notifications via e-mail on. I belong to several Facebook groups. The groups I belong to are through my choice and consist of people and content I am interested in. I can’t belong to every group in existence, nor do I want to. Imagine if businesses could choose whether you liked their page or not. There would be many businesses who would just add everyone on Facebook and leave it up to each person to unlike it. To compound matters, there are some people who will not only add me to a group, but after I LEAVE the group, will RE-ADD me. It’s presumptuous and arrogant to take it upon yourself to decide for others where their interests lie. By doing this, you make yourself no different than the person who decided everyone you know could benefit from Viagra. … and there’s a word for people who do that: spammer.